The Optional Protocol to the International Covenant on Economic, Social and Cultural Rights (OP-ICESCR) allows victims of violations of ESCR to present complaints before a United Nations body, against a state that violates its obligations established in the International Covenant on Economic, Social and Cultural Rights (ICESCR), if the state has ratified the OP-ICESCR. Below are resources providing information to NGOs, especially those working at the national level, who wish to support the OP-ICESCR and advocate for state ratification. Has your country ratified the OP-ICESCR? Check the status of your country here. Your country may have signed the treaty but not ratified it, check here. Their signature demonstrates an intention to ratify the OP-ICESCR. If your country is a member of or candidate for the Human Rights Council, ratifying the OP-ICESCR would be an important demonstration of human rights leadership. If your country is being reviewed by the Committee on ESCR or approaching a Universal Periodic Review (UPR) before the Human Rights Council, this is an important moment for advocacy. Send a letter encouraging ratification of the OP-ICESCR to your Ministry of Foreign Affairs (MoFA) or other relevant officials involved in considering international commitments and treaties. If possible, get support from several organizations as co-signatories to the letter. Download a model letter here. Request a meeting with your MoFA or other relevant authorities. For suggestions, please see Booklet 4 of the Toolkit on the OP-ICESCR. Booklet 3 outlines arguments for why countries should ratify the OP-ICESCR. Write a blog, op-ed or press release highlighting the reasons for ratification, if your country has not ratified, or celebrating access to justice at the international level, if it has ratified. This Q and A may be helpful. Build a national coalition for ratification, including other human rights and social justice organizations, unions, social movements, artists and other concerned people. You might start with an online petition or a public action/demonstration. Or invite others to join any of the actions above. 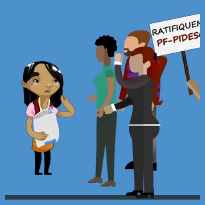 This animated video highlights that access to justice is key to the full recognition and implementation of human rights, and can be used as a tool to promote ratification of the OP-ICESCR. The video is available in English, Spanish, French, Arabic, and Portuguese. A promotional brochure explaining what the OP-ICESCR is, why it is valuable for people and important for governments. The brochure is available in English, Spanish, French, and Arabic. This manual provides theoretical and practical information for lawyers and other advocates interested in utilizing the OP-ICESCR as a means to ESCR. The manual is available in English and Spanish. This 4-part toolkit provides practical guidance to NGOs and other civil society groups, as well as States, on their work around the OP-ICESCR. The toolkit is available in English, Spanish, and French. This factsheet examines the ratification of the OP-ICESCR by Uruguay and outlines the advocacy strategies adopted by civil society. The factsheet is available in English, Spanish, and French. 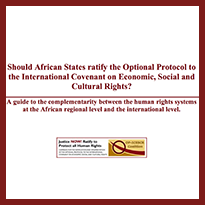 This guide outlines the complementarity between the human rights systems at the regional level in Africa and the international level. The guide is available in English and French. For more information on the OP-ICESCR, find a complete list of resources here.